Office and industrial design professionals often have to consider appearance and durability when selecting wall partitions. Unfortunately, most of the office partitions on the market today favor appearance over durability and stability. However, PortaFab Modular Building Systems has developed a product that bridges the gap with its new free standing wall system. Meeting the industry’s 5 lb. per lateral load requirement for walls over 60”, the PortaFab line of free standing walls is more durable and stable than traditional office partitions while still looking sleek. 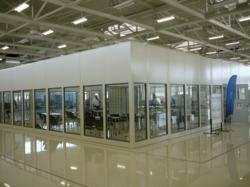 PortaFab’s free standing wall partitions are constructed using the OmniFlex 300 system. The system’s free standing steel wall supports enable the system to be installed in virtually any space without needing to be anchored to a load bearing wall or structure. Walls can utilize a variety of composite panels including steel-faced panels, fiberglass reinforced panels, hardboard or aluminum honeycomb panels; however most companies select PortaFab’s Fire and Sound Panels for their sound reduction and thermal properties. “Standard office partitions do not meet lateral load requirements and are typically not recommended for industrial applications. For in-plant and industrial settings, walls above five feet tall are very common so meeting these load bearing requirements is mandatory. Even in office settings, however, the added durability and stability of these wall systems reduces the risks associated with typical cloth office partitions,” said McGee. Free standing wall partitions are also not limited to standard shapes and finishes. The three inch wall panels come in a variety of heights and can be painted custom colors in order to match the existing interior design of an office or industrial space. Many companies also install window panels at the top of the wall partitions in order to allow light to flow between areas and to support supervision efforts. “Companies are installing these wall partitions for applications as diverse as bulletin boards and laser rooms as well as more traditional applications like in-plant offices and manufacturing cells. By installing wall partitions instead of complete offices, all of the existing lighting and HVAC systems can be utilized. This can translate into major energy savings and is an effective way to renovate almost any space without committing to a major construction project,” said McGee.